This article aims to introduce the PPE Directive to relevant economic operators such as manufacturers, importers, distributors and authorised representatives; to describe the scope and definitions as laid out by the PPE Directive; to define the responsibilities of the PPE Directive; and to set out the conformity assessment procedure within the Directive. 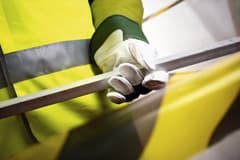 With the basics in place, the spotlight is then turned to glove standards, with the specific requirements for industrial hand protection described later in this article. PPE is defined as: “Any device or appliance designed to be worn or held by an individual for protection against one or more health and safety hazards.” Examples of PPE are protective clothing including gloves, jackets and trousers, respiratory protective devices, personal eye protection, industrial safety helmets, and hearing protectors. Types of equipment specifically not covered by the PPE Directive are protective equipment for use by the armed forces, PPE for self-defence such as personal deterrent weapons, and helmets and visors intended for users of two or three wheeled motor vehicles. In addition, presentation of PPE that is not in conformity with the provisions of the Directive is allowed at trade fairs and exhibitions, provided that an appropriate notice is displayed drawing attention to this fact. The PPE Directive has two main functions: • To put in place harmonised conditions governing the placement of PPE on the European Union internal market • To provide basic safety requirements, which PPE must satisfy to ensure health protection and safety of its users The basic health and safety requirements (BHSRs) as laid down within the PPE Directive cover aspects such as ergonomics, innocuousness, comfort, efficiency and the information such as instructions as supplied by the manufacturer. The PPE Directive is currently the oldest of the so called ‘new approach’ Directives. As such it lacks a coherent distinction of economic operators, such as manufacturers, importers, distributors and authorised representatives, as well as their responsibilities as recently introduced by the New Legislative Framework for the marketing of products. This omission is to be rectified by future PPE regulations, which will be discussed briefly later in this article. Nevertheless, the current PPE Directive identifies manufacturers and authorised representatives as main actors responsible for establishing conformity with the PPE Directive. The main obligation of a manufacturer placing its PPE on the European market is to ensure that it satisfies the BHSRs, as laid down by the PPE Directive. He or she can achieve this by using European harmonised standards, the references of which are published in the Official Journal of the European Union. By using harmonised standards, the European Union Member States presume that the PPE satisfies the BHSRs. The second main obligation of a manufacturer is to affix a CE mark and to provide an EC Declaration of Conformity. EU member states should regard PPE bearing a CE mark that is accompanied by an EC Declaration of Conformity to be compliant with the BHSRs as well. It is important to realise that by affixing the CE mark, the manufacturer declares that the product not only satisfies the requirements of the PPE Directive, but that it also conforms to the provision of other applicable European Union harmonisation legislation. The manufacturer or authorised representative has the obligation to put together technical documentation, regardless of the category. The technical documentation must be comprised of all relevant data on the means used by the manufacturer to ensure that PPE complies with the BHSRs. Category I Manufacturers of simple design PPE are allowed to assess the level of protection and declare conformity by means of a Declaration of Conformity, without the interference of a notified body. Category II Manufacturers of Category II PPE are subject to an EC type examination by a notified body, followed by a Declaration of Conformity by the manufacturer. This category covers PPE that is defined by neither Category I nor Category III. Category III Manufacturers of Category III PPE are subject to an EC type examination by a notified body and to one of the two quality assurance procedures as described in Article 11 of the PPE Directive. Upon completion, the manufacturer must compile a Declaration of Conformity. Under the PPE Directive there are currently 21 harmonised standards that cover or are related to protective gloves. These include the EN 374 series for protective gloves against chemicals and micro-organisms, EN 388:2003 for protective gloves against mechanical risks, EN 511:2006 for protective gloves against cold, and EN 14328:2005 for gloves and armguards that protect against cuts from powered knives. The main standard, however, for protective gloves is EN 420:2003+A1:2009, which covers the general requirements and test methods for protective gloves. The scope of the EN 420 standard is to define general requirements and relevant test procedures for glove design and construction, resistance of glove materials to water penetration, innocuousness, comfort and efficiency, and markings and information supplied by the manufacturer. This standard addresses the protective properties of gloves and should therefore not be used alone, but rather in combination with the appropriate specific European Standards. Pursuant to paragraph 4.1 of the standard, the gloves should be designed and manufactured so that in the foreseeable conditions of use for which the glove is intended, the user can perform the hazard related activity normally while enjoying appropriate protection at the highest possible level. Additional characteristics taken into account by the EN 420 standard are resistance of glove materials to water penetration, innocuousness requirements, cleaning instructions and electrostatic properties. The testing of PPE is usually carried out by an accredited test laboratory. Specific test methods, detailed calculation methods and technical procedures can be found in the aforementioned standards and the references therein to other international and European standards. In addition to requirements and test methods, the EN 420 standard provides for marking requirements on the glove and packaging marking, such as the name of the manufacturer, the commercial name of the glove, size designation and other practical information for the potential buyer or end-user of the gloves. The PPE Directive has a proven track record spanning the last two decades. It ensures that PPE marketed within the European Union complies to basic health and safety requirements as set out in the Directive. While the ‘new approach’ is still in place, the European Union has identified and recognised several problems that were overlooked during the introduction of the PPE Directive. This led to an update of the ‘new approach’, as introduced by the new legislative framework. The concept and objective of this new initiative was used for drafting a new piece of legislation – the proposal for a regulation on Personal Protective Equipment. The overall objectives of the proposal are to better protect the health and safety of PPE users, to ensure a level playing field for PPE economic operators within the internal market, and to simplify the European regulatory environment in the field of PPE. The proposed regulation will become applicable two years after its entry into force. The final text is expected to become available this year (2014), meaning the entry into force will be at some point in 2016.